The monument was installed in the rotunda of the State Judicial Building, in Montgomery, AL on 2001-AUG-1. The building houses the Alabama Supreme Court. Chief Justice Roy Moore was ordered by the 11th U.S. Circuit Court of Appeals to remove the monument because it violates the First Amendment of the U.S. Constitution and its principle of separation of church and state. He refused. Americans United for Separation of Church and State, (a.k.a. Americans United) has indicated that they would probably file a lawsuit. 2001-AUG-31: Alabama: Response to the Chief Justice's Decalogue monument: "In what may be a prelude to court action, the American Atheists State Director for Alabama has asked for permission to display a sculpture of the organization's logo in proximity to a controversial Ten Commandments monument erected in the Judicial Building....[Attorney] Larry Darby said that he wished to install a small presentation featuring the atomic whirl, 'representing the importance of the use of scientific analysis in the creation of a better life for mankind. '...Referring to the large Decalogue monument, Darby continued: "There are plenty of churches, mosques, temples and other houses of worship for the citizens of this state where they may voluntarily practice their faith. We don't need to turn the state court building into a religious shrine. This is all about the separation of church and state. 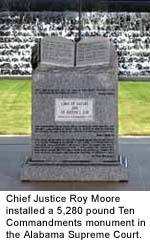 Judge Moore used his authority as Chief Justice of the supreme court to erect a monument which, to any reasonable observer, is religious and commands obedience to a particular God." 2002-DEC-12: Legal battle over 5,280 pound granite monument continues: The plaintiff's attorneys have submitted a bill to Judge Moore for $ 704,000 in legal fees to cover the expenses of six lawyers and nearly a year of research and case preparation. 2002-DEC-16: Demonstration and counter-demonstration:American Veterans in Domestic Defense and the Alabama Christian Coalition rallied about 350 supporters in front of the state capitol building. They urged that the Ten Commandments remain. Retired Colonel and AVIDD member, James Ammerson from Dallas, TX, gave a speech covering many topics, from the monument to President Bush's portrayal of Islam as a peaceful religion. He suggested that the United States may have to "burn a couple of nations down." He said: "I've read the Koran, and I believe Allah's proper name is Lucifer." He suggested that the only way America could survive the present moral crisis is to be believe in God "and live according to the tenets of his Good Book, the Bible....The Ten Commandments are the kinds of things (sic) that allow us to have a decent society where we can live together in peace..."
James Cabaniss, the president of the AVIDD, criticized the courts for ordering the removal of religious monuments, and added that America "had lost its way...Lawyers are trained with the tools to be deceptive. With any absence of moral integrity they become evil forces in society." presents a public facade of being concerned with 'culture' and 'heritage,' and has become increasingly hostile toward blacks and other minorities. The group's president, Michael Hill, denounces racial intermarriages and has described slavery as a 'God-ordained' institution." In reaction to the rally was a greatly outnumbered counter-demonstration organized by Atheists and others who support the separation of church and state. AANews reported that: "While there were no physical confrontations, there were verbal exchanges including cat-calls from the AVIDD contingent describing the Atheists as 'white trash'." 2003-JUL-1: Court of Appeals rules that the monument must go: The 11th Circuit Court of Appeals in Atlanta unanimously ruled that the monument's presence violates the constitution. Judge Ed Carnes wrote the ruling on behalf of the court. He stated that if the monument remained, then "the chief justice would be free to adorn the walls of the Alabama Supreme Court's courtroom with sectarian religious murals and have decidedly religious quotations painted above the bench....Every government building could be topped with a cross, or a menorah, or a statue of Buddha, depending upon the views of the officials with authority over the premises." Attorney Ayesha Khan, legal director for Americans United for Separation of Church and State, said: "The Ten Commandments are too personal, too holy, too sacred to be used as a political football by Justice Moore. What Justice Moore did in this case is so egregious that we felt confident all along that we would prevail." Sadie Fields of the Christian Coalition of Georgia wrote: "Once again the court, basing its decision on humanistic standards, continues in its relentless quest to erase the God of the Bible from the public square. The courts are increasingly exercising raw judicial power, ignoring the checks and balances found in the Constitution. Without the guiding principles of that document, and acknowledgement that it was written based upon eternal truths, the U. S. Supreme Court – and other courts – are fast on the way to becoming the supreme law of the land." 77% of the public either approved or strongly approved of the monument. 65% said that they would vote for him if he sought re-election as chief justice. 50% said that they would disapprove if Moore defied a federal court order to remove the monument if his appeals fail; 40% would approve. In a statement, Judge Moore wrote: "This is not about polls; it's not about politics; it's not about religion. It is about the acknowledgment of God as the foundation of our moral law, under both the United States Constitution and the Constitution of Alabama, and the truth stated in the Preamble of our Alabama Constitution that, in order to establish justice, we must invoke the favor and guidance of Almighty God. A federal court has no jurisdiction to tell us that we can not acknowledge God." 2003-JUL-23: Congress votes to prevent removal of monument: In an unusual move, by a vote of 260 to 161, the House voted in favor of an amendment introduced by Rep. John Hostettler (R-IN) which would prevent the expenditure of federal funds to remove the monument. The amendment was attached to the Commerce, Justice, State and Judiciary spending bill. The legislation is now pending in the Senate. It would seem that the 260 Representatives who voted in favor of the amendment were violating their oath of office, which commits them to supporting the Constitution. "Moore files appeal notice on order to remove Commandments monument," AANews, 2002-NOV-11. "Moore pledges appeal," AANews, 2003-JUL-3. "Atheist director contacts Moore, asks for 'equal access' to commandments are of Alabama judicial building." AANEWS, 2001-AUG-31.